Marian Price sent to Maghaberry for "operational reasons"
The Prison Service has confirmed that prominent dissident spokeswoman Marian Price is being held in Maghaberry men’s jail instead of Hydebank Wood women’s prison. The 57 year-old spokeswoman for the 32 County Sovereignty Movement (CSM) was returned to prison on Monday after Secretary of State Owen Paterson revoked her licence, claiming she posed a significantly increased threat to society. She had appeared in court in Derry on Monday to face charges of encouraging support for an illegal organisation. 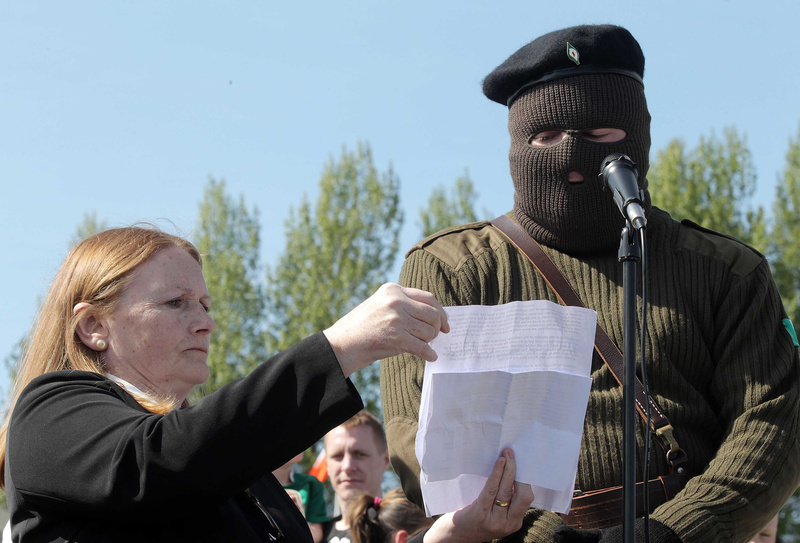 The charge relates to an incident in which Ms Price was pictured holding up a statement read by a masked Real IRA man at a dissident republican rally in Derry on Easter Sunday. She claimed that the masked man had asked her to hold the sheet and that she had no knowledge of the content of the statement. She was released on bail on these charges but the court was then informed that the Secretary of State had decided to revoke her licence. In 1973 Ms Price was jailed for 20 years for her involvement in a PIRA bombing campaign in London. However, instead of sending the 57 year-old to Hydebank Wood women’s jail, where every other female prisoner is held, a Prison Service spokesman confirmed that a decision had been taken to instead send her to Maghaberry for “operational reasons”. It is understood that Ms Price is now being held on a prison wing in Maghaberry on her own. The women’s wing at Maghaberry was closed in 2004 with all female inmates being transferred to Hydebank. However it is understood the decision to incarcerate Ms Price in Maghaberry has led to a ``logistical headache” for prison chiefs, who may now have to consider re-opening a dedicated wing for female republican prisoners at the Co Antrim jail. Republican and loyalist male inmates are already held on separate wings inside the Co Antrim prison, because of their paramilitary allegiances. Ms Price is understood to have insisted that she is entitled to be treated as a republican prisoner and not expected to associate with `ordinary’ inmates. A Prison Service spokesman said it did not discuss individual cases. Security sources have confirmed that prison chiefs will now be forced to consider opening a female republican wing, if any other women are remanded in custody on dissident charges. At present a number of females are awaiting trial in connection with dissident activities. However, all have so far been released on bail while awaiting trial. In 1973 Ms Price was jailed for life for her part in the PIRA bombing campaign in London which injured 200 people, including one man who died as a result of a heart attack. Her sentence was later reduced to 20 years. Ms Price, her sister Dolours and Sinn Fein’s Gerry Kelly later went on hunger strike for 200 days to be repatriated to serve their sentences in Northern Ireland. The Price sisters were returned to Armagh Prison in 1974. In 1980 Marian Price was released from Armagh jail after then Secretary of State Humphrey Atkins granted her a Royal Prerogative of Mercy (RPM), as she was seriously ill and suffering from anorexia and tuberculosis. “She is rapidly reaching a point where she cannot any longer be treated in prison," a Prison Service spokesman said at the time. “We have taken the most expert medical advice in this matter and the Secretary of State (for Northern Ireland) has made his decision on humanitarian grounds in the hope that her condition may be checked." Ms Price’s legal team are now understood to be preparing to launch a legal challenge, arguing that the Secretary of State was not legally entitled to order that the 57-year-old should be returned to prison, as she had been released by Royal Prerogative of Mercy and not on licence. However, a Northern Ireland Office spokesman last night insisted that Mr Paterson had been entitled to order Ms Price’s return to prison, claiming that she while she had been granted an Royal Prerogative of Mercy, she had also been released on licence at the same time.